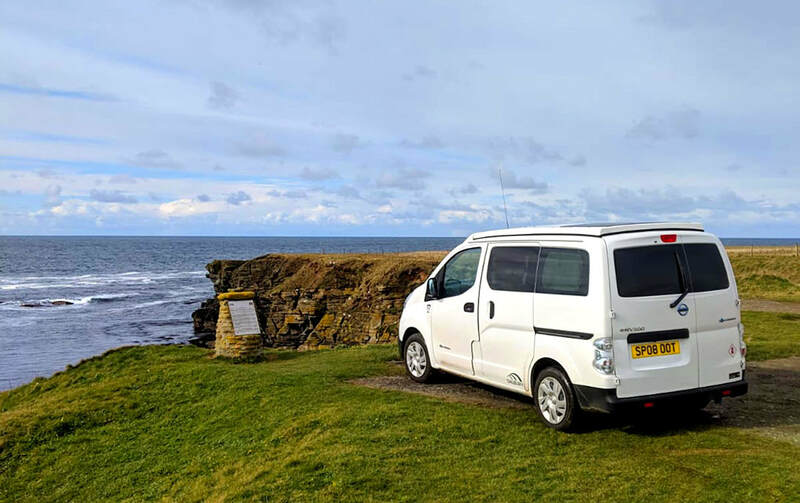 JP Orkney's Electric Camper Van Hire is a great option for fun days out and a comfortable night's sleep - and it's environmentally friendly too. 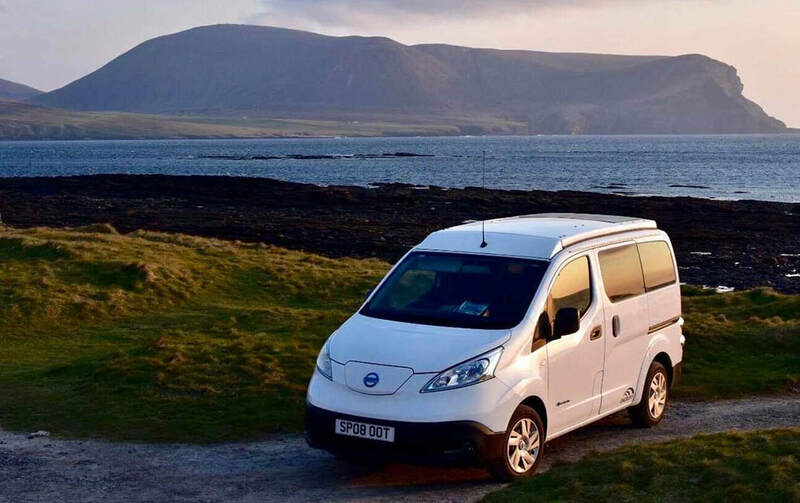 The Nissan Dalbury E is the world's first all-electric camper van, giving you cooking facilities on hand, a warm shelter and no costly fill-ups at the petrol pump. 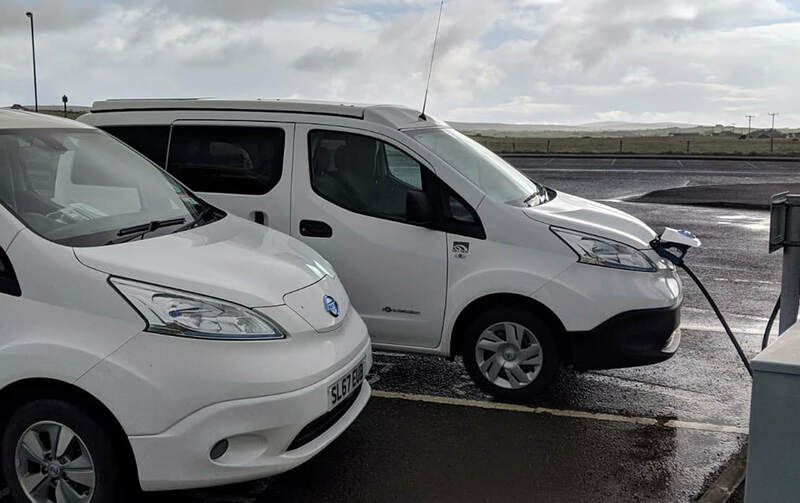 Orkney has over 30 charging points - on a full charge you can easily cover up to 150 miles, then rapid charge in 20 minutes for another 80 miles. 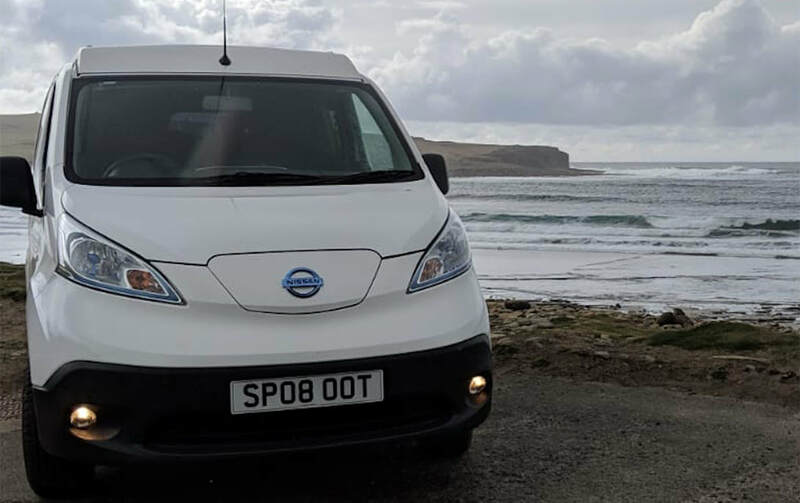 We've called our camper van Spoot (the Orcadian name for a razor clam) and he's part of the family alongside our electric tour van Evie. 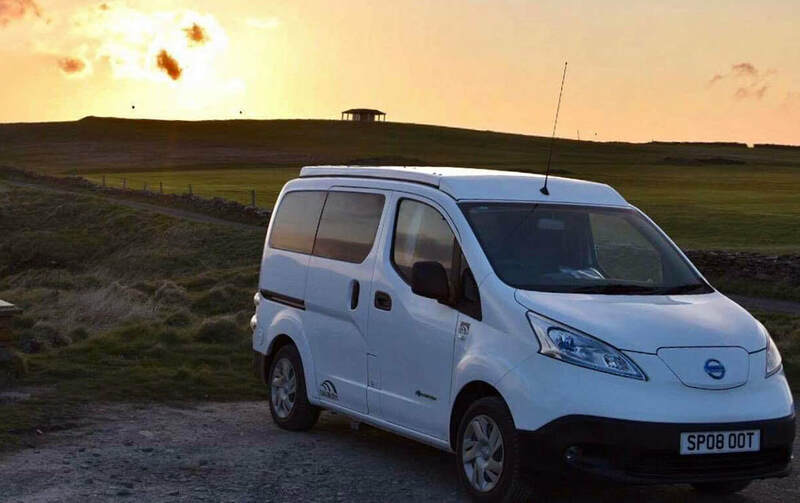 We love our electric vans and we're sure you will too! Online booking will be available soon, but in the mean time if you'd like to enquire about dates and prices please email us. Where will I pick up and drop off the camper van? 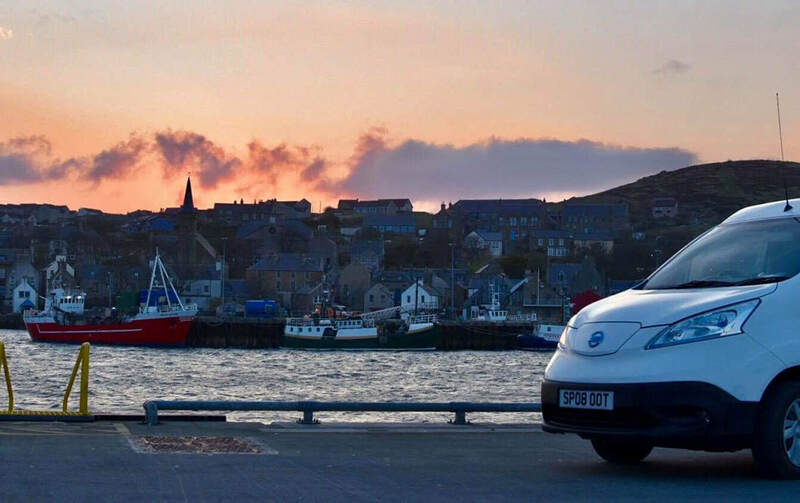 We can meet you anywhere on mainland Orkney, whether you’re a foot passenger arriving in Stromness or have caught a flight into Kirkwall. Just let JP know what your plans are and we can work something out. Are dogs allowed? Sadly we can’t welcome four-legged friends in our camper this season. This is something we hope to change as our camper numbers increase. How will I know how to work everything? JP will be on hand at collection to show you how things work, from lifting the roof to working the sat nav. 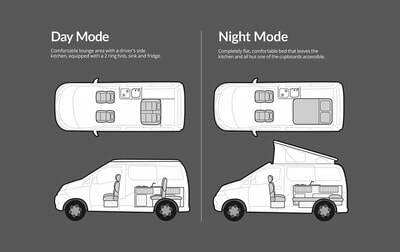 How and where do I charge the electric camper van? In the initial demonstration we will show you - it’s as simple as plugging it in! In the van's welcome pack a list and map of charging points across Orkney are given. You can also find all the locations here. How often will the van need charging? A number of things can have an impact on the range, for example load and driving style. However, as a rule of thumb, you can cover up to 150 miles on a full charge. 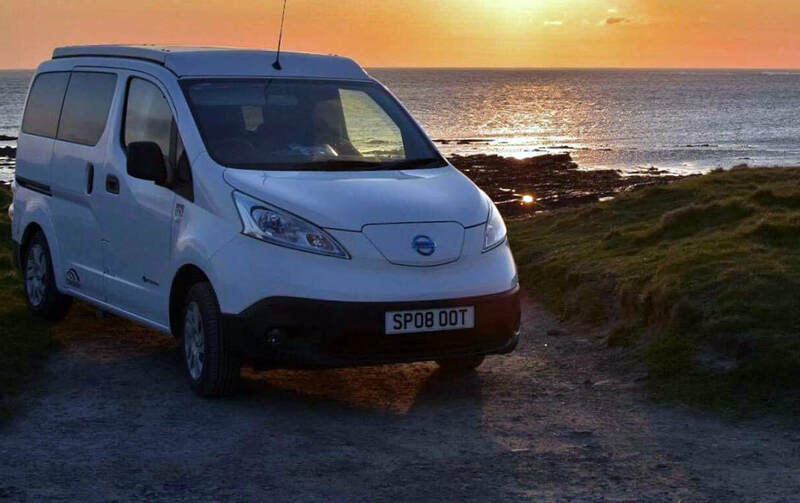 A rapid charge (points are around the island) can give you up to 80% charge in around half an hour. 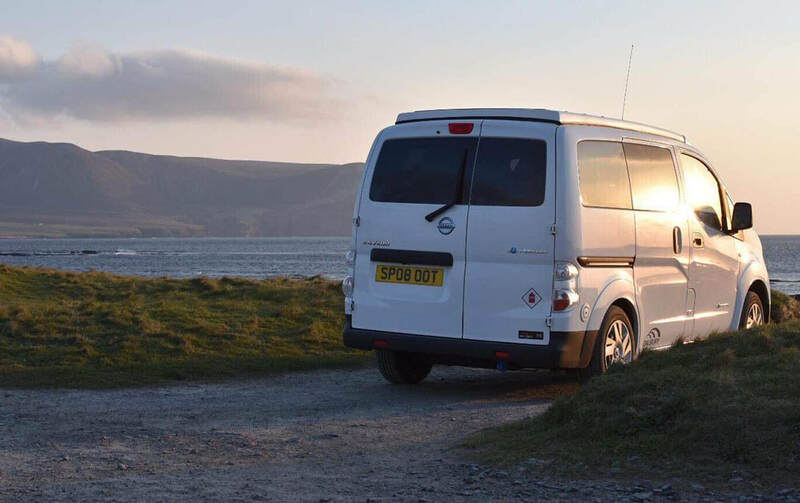 Most campsites offer hook up facilities that can be left on overnight giving you a full charge for the next day (Orkney mainland is approximately 26 miles in length). The van is fitted with solar panels on the roof which will power your smaller items. What happens if I run out of charge? The Orkney locals are a friendly bunch, so please don’t be afraid to ask for help and try charging at someone’s house (cables are in the van). If this is not possible please call JP who will organise a recovery. Try avoiding this as you will incur a charge and it will be more expensive if you are not on mainland Orkney. Who can hire a camper? Anyone with a full driving licence aged from 25 to 75 and held this for at least two years. If under 25 or over 75 please contact us as our insurers maybe able to accommodate. Can children sit in the back? Children can sit in the back as per legal requirements. We have access to some Isofix car seats, so please ask if you’d like to use them free of charge. You will need to fit them yourselves. The back seats have Isofix brackets suitable for Isofix-fitted car seats. Can I book a Food & Drink Tour too? Absolutely, however you will need to book this separately from the camper van hire. Do I need to pay the £500 security deposit? Yes. We require a £500 security deposit before you can drive the camper. This will be held and refunded on return of the camper, provided it and all contents are in the same condition they were received.